Why WAVY is not just another surface drifter? Surface drifters have been used for a long time to gather information about Ocean motion. A significant evolution has occurred though since the message-in-a-bottle to present day’s high accuracy GPS-positioned, multi-sensor, real-time tracked drifters. The modern age of surface drifters began in the early 1980’s with the development of a drifter designed to measure currents in the upper metre of the ocean by Dr. Russ Davis, of the Scripps Institution of Oceanography. Robust enough to measure currents over open Ocean and estuarine waters, the Davis Drifter consists of a 90 cm cylindrical hull, 10-15 cm in diameter, containing batteries and electronics. The drifter floatation is ensured by four small floats connected to the end of the arms to which the sails are attached. 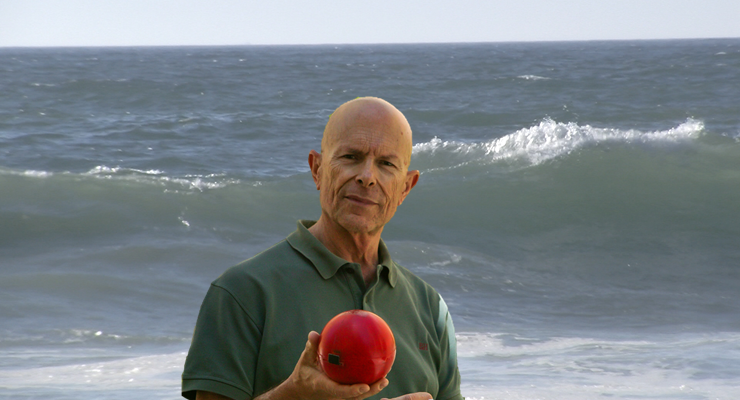 The Coastal Ocean Dynamics Experiment (CODE) adopted the Davis drifter, and the Lagrangian Drifter Laboratory (LDL) developed a buoy controller that enabled it to carry different sensor payloads. The CODE/DAVIS drifter’s design virtually eliminated the effect of direct wind forcing and substantially minimized Stokes drift. Although bulky and not easy-to-handle it is, nevertheless, still under commercialization and widely used. Different float designs were tested along the 1980’s to satisfy the requests of the World Ocean Circulation Experiment. These resulted in the Surface Velocity Program (SVP) configuration adopted by the National Oceanic and Atmospheric Administrations’ (NOAA) Global Drifter Program: a holey sock drogue centred at 15 m below the surface, suspended from a spherical float with nearly equatorial buoyancy. This arrangement practically eliminated Stokes drift and showed acceptably low downwind slip. If the drogue was lost, however, the slip increased more than one order of magnitude. Adopted by the Global Ocean Observing System (GOOS), LDL developed the lower-cost mini-SVP (35cm sphere) drifter to satisfy GOOS’s goal of covering the ocean surface with 1,250 measurement devices. Based on the concept of the mini-SVP drifter, LDL has been sustaining the production of several lines of surface drifters, including an undrogued one capable of delivering directional wave spectra, and another one provided with wind and atmospheric pressure sensors. LDL remains a world reference in surface drifters’ production. Nevertheless, the mini-SVP drifters are neither cheap nor easy to store, transport and deploy. A simpler and cheaper drifter might help achieve GOOS’ goal, thereby contributing to improve the knowledge of ocean dynamics and the quality of ocean and weather forecasts. The development of devices to measure surface currents over deep-sea was not followed by a similar drifter development for the nearshore dynamics. To our knowledge, WAVY is the first drifter to have been designed specifically to carry out measurements in the surf zone. It is a product being developed by the MELOA, with its foundations in RAIA Regional Oceanographic Observatory, resulting from the joint work of the Faculty of Engineering of the University of Porto (FEUP) and OceanScan-MST, under request of Instituto Hidrográfico (IH) with complementary work of INESC TEC (current members of MELOA Consortium). Intended to be a low-cost device once manufactured at an adequate scale, WAVY is a light-weight and easy-to-use, store and transport surface drifter. In its basic configuration, it may be used to study processes at beaches, estuaries and tidally-driven lagoons. Its spherical shape allows it to re-float after stranding, while its optimized buoyancy reduces wind exposure to a minimum. It is not insensitive to Stokes drift but, while this sensitivity is nearly irrelevant in nearshore or inshore areas, it may represent an advantage when attempting to track the evolution of an oil spill. WAVY is currently capable of acquiring, and storing, position at frequencies up to 1 Hz for a time length of 36 hours. In case real-time data is required, transmission is possible over a mobile communications network at a rate up to 0.2 Hz Once recovered, the whole recorded data set may be downloaded via Bluetooth. A viewer enables the real-time tracking of the WAVY positions (in case some needs to be recovered at sea) and also inspections of the databases. WAVY is the first of a family and the starting point of the MELOA generation. Find more about the WAVY family of products here.